“Hallowe’en” (1931) with Toby the Pup! EDITOR’S NOTE: This month, as most of you know, is the 90th Anniversary of the debut of Walt Disney’s Mickey Mouse. Two of our contributors have now created the definitive book on the character – Walt Disney’s Mickey Mouse: The Ultimate History. 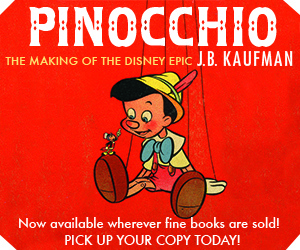 J.B. Kaufman and David Gerstein, along with editor Daniel Kothenschulte, have created a must-have, must read for anyone who loves the mouse – but its particularly of interest to fellow historians as they’ve uncovered new art and new information via unlimited access to Disney’s Archives as well as public and private collections around the world. Concept art, story sketches, background paintings, animation drawings, as well as unfinished projects, many of them presented for the first time through original storyboard drawings – including one by Jim Tyer (!!) – which unveil a Mickey that might have been. Extensive archival research sheds new light on little-known chapters of Mickey’s career, such as his pioneering radio shows, the origins of the Mickey Mouse Club, and his use as a patriotic icon during World War II. Like many “overnight successes,” the success of Mickey Mouse did not happen overnight. Audiences and critics were delighted by Steamboat Willie when it opened at New York’s Colony Theater in November 1928, but that and the other early cartoons were distributed in a haphazard way, and moviegoers across the U.S. and around the world gradually began to discover Mickey for themselves during the following months. By the end of 1929, Mickey was becoming a bona fide popular favorite. This long-awaited success, after years of hard work, brought out an entrepreneurial instinct in Walt Disney. Capitalizing on that early momentum, he sought creative new ways to promote his cartoon star. 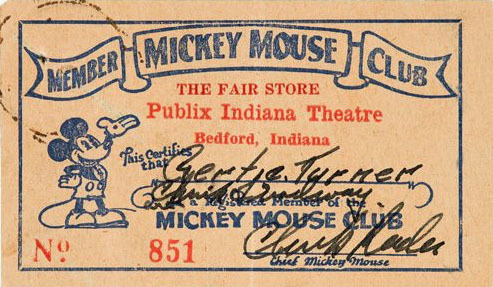 One such idea came to him in September 1929 when a California exhibitor started a “Mickey Mouse Club” for children at one of his theaters. Walt was delighted with this idea and immediately expanded on it, promoting a nationwide chain of Mickey Mouse Clubs and putting the Disney studio’s support behind them. 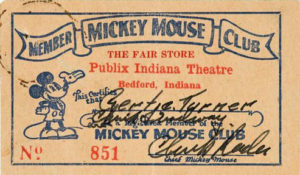 The studio supplied membership cards and other paraphernalia for club members, and sent a special promotional trailer to theaters hosting the clubs. 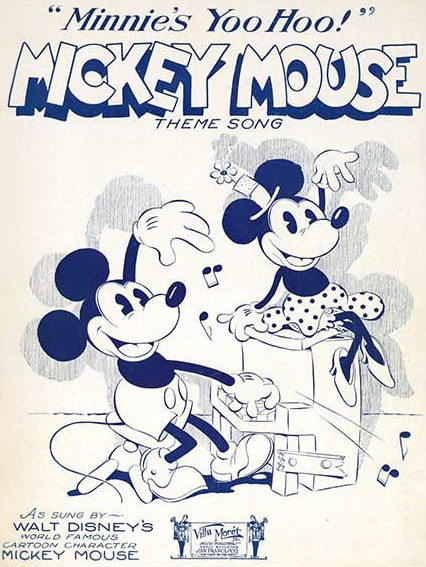 This trailer could be shown at the Saturday-matinee meetings, and depicted Mickey himself leading the young viewers in singing the club’s theme song. The song, of course, was “Minnie’s Yoo Hoo,” composed by Carl Stalling for the 1929 short Mickey’s Follies. The highlight of that cartoon was Mickey’s performance of the song for an enthusiastic audience of barnyard animals. “Minnie’s Yoo Hoo” was the Disney studio’s first original song. It was published as a song sheet later in 1929—another promotional enterprise—and became the theme song of the Mickey Mouse film series, played instrumentally under the main titles of every Mouse short for the next four years. 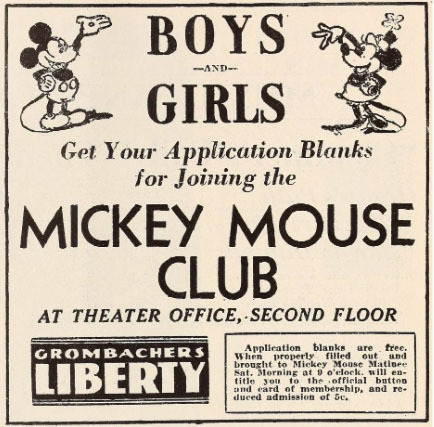 Now, in 1930, it logically became the theme song of the Mickey Mouse Clubs as well, and theaters full of young club members sang it as Mickey conducted them from the screen. Most of Minnie’s Yoo Hoo, the film, is cannily assembled from art that had been created for other films. Most obviously, Mickey’s performance of the first verse and chorus is animation from Mickey’s Follies, the film that had introduced the song in 1929. The opening scene, with Mickey at the piano accompanied by his animal ensemble, is also taken from Mickey’s Follies. The velvet curtain that opens and closes several times during the reel is animation from a later short, Fiddling Around (the film that is sometimes misidentified by its working title, Just Mickey). Only the group “YOO HOO” at the end of the chorus, and Mickey’s spoken addresses to the audience, were animated expressly for this singalong reel—and, in addition, much footage is consumed by title cards reproducing the song lyrics. The animation of Mickey’s singing action here is noteworthy. His wild gyrations are exaggerated for comic effect—but they’re also exaggerated for another reason. It’s important to remember that in the summer of 1929, when Mickey’s Follies was produced, the idea of an animated character speaking dialogue was still a novelty. 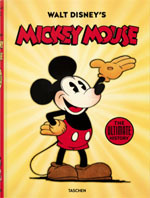 Mickey himself had spoken dialogue on the screen for the first time in the previous cartoon, The Karnival Kid, produced about a month earlier. We know from Walt’s letters to his distributor, Pat Powers, that he was tremendously excited over this innovation—and we know from Powers’s correspondence that he did not share Walt’s excitement. Powers, in fact, actively discouraged Walt from letting Mickey speak dialogue in his pictures. Anxious lest the use of English dialogue make the films less salable in foreign countries, Powers pressed for predominantly visual comedy that would be universally understood. Walt had always featured visual comedy in his films, and would continue to do so—but it’s significant that he not only refused to abandon dialogue, but actually raised the bar in Mickey’s Follies, letting Mickey sing English lyrics in the film’s key sequence. Mickey’s exaggerated lip movements are part of his enunciation, making the lyrics unmistakably clear to an audience that was unaccustomed to singing cartoon characters. And, of course, when the same animation was repurposed for this singalong reel, that overdone enunciation was useful in helping young viewers follow the words of the song. Production papers suggest that Mickey’s singing scene was originally animated by Ben Sharpsteen, and despite the unusual focus on Mickey’s extreme mouth action, Sharpsteen’s characteristic animation traits do seem to be on display here. In 1930, when the scene was adapted for the singalong film, Sharpsteen was again called on to provide the new bridging animation. It’s perhaps also worth noting that Minnie’s Yoo Hoo, the film, includes the second verse of the song. 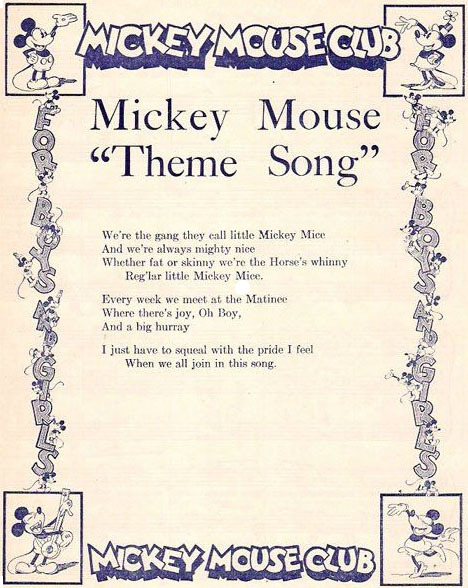 The second verse was included in the published song sheet, but was not heard from the screen—apart from this little reel for the Mickey Mouse Clubs. Is there someone different singing the song here than in Mickey’s Follies? The singing sounds different here. Yes, you’re right. Contrary to legend, Walt was not immediately assumed to be Mickey’s voice talent; the role was passed around to various studio hands before he took over on a regular basis. And, in 1972 of course, it was reused in Walt Disney’s “Mouse Factory”! With the original 1930s vocals! Thanks so much, J.B., for identifying Ben Sharpsteen’s animation in “Mickey’s Follies” and “Minnie’s Yoo-Hoo”! I’ve been asked a couple of times if I could name the animator who did the wildly over-pushed lip action on Mickey’s singing and I didn’t have a clue. Have you seen a draft for “Minnie’s Yoo-Hoo” that details the scene breakdowns? The scenes where Mickey opens the curtain and speaks to the audience don’t look like Ben Sharpsteen’s work, they appear a bit pulled in and limited, using separate body and head cels for the dialog. The final shot with Mickey applauding the audience, also looks much more conservative than Sharpsteen’s all stops out stuff from “Mickey’s Follies”. It is likely that ‘Minnie’s Yoo-Hoo’ was assisted by an unknown animator that appears to have drawn for ‘The Cactus Kid’ when Mickey pulls out his gun, ‘Wild Waves’ when Mickey sings at the opening and when Minnie steps out of the bath house, ‘Fiddling Around’ when Mickey adjusts his fiddle, ‘Jungle Rhythm’ during the scene where two lions circulate Mickey in a static pose, and ‘The Haunted House’ when Mickey tries to pull out his umbrella in the rain. Got any sheets for those? Mickey and the other musicians saying “Yoo-hoo” in this club reel looks to have been done by a different animator, likely who worked on ‘The Jazz Fool’. Thanks to you both. Identifying the animators in the earliest Mickeys can be tricky because the drafts don’t appear to have survived, and very often one does have to rely on spotting the individual animators’ styles. But, as I indicated in the column, this was one instance in which I didn’t have to trust my own eyes; we don’t have the drafts but we do have the exposure sheets. Kaufman: If that really is Ben Sharpsteen in ‘Minnie’s Yoo-Hoo’ doing the extra animation, it must have been assisted by an inbetweener? Ben’s animation in ‘The Plowboy’ is certainly NOT anywhere near how limited and jerky the extra animation is. 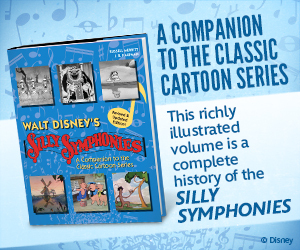 Was Ben mainly working on the Silly Symphonies during 1929? I’m also looking to dispel the myth that Ub Iwerks did any scenes for ‘The Cactus Kid’; he left the studio much earlier than when this short was finished, and I’m not able to find any sources that proved this fact. Jackson: It’s certainly possible that Sharpsteen was assisted by, or delegated some work to, a junior artist for the added scenes in “Minnie’s Yoo Hoo.” Later on, both Sharpsteen and Dave Hand would routinely work with crews of junior animators, delegating scenes to them and supervising their work. It’s possible that this was an earlier version of the same system, done simply for expediency. If the animation in those scenes looks stilted and jerky, it may have more to do with an attempt to pre-time the lip movements to synchronize with dialogue that was yet to be recorded. No, Sharpsteen worked on both series during 1929, but concentrated mainly on the Mickeys. I am beginning to think that this scene was animated by Johnny Cannon; at least in terms of drawing style. The way he draws Mickey in ‘The Picnic’ slightly differs, but bears similarities, including pupil proportions. The last 3 scenes of Mickey riding the horses in “The Chain Gang”. The draft says that they were animated by Sharpsteen himself, but I absolutely refuse to believe it. It all looks off, nothing in there looks like his style, and are an entire juxtaposition to the first scene where they appear (scene 42), also animated by Sharpsteen, including the timing, the pacing of their gravity and way the horses move their heads around. I somehow believe an assistant animator was involved. OK, I have come to possibly a theoretical conclusion: there was an assistant animator, possibly supervised by both Jack King and Ben Sharpensteen. In the earliest film I know with Jack King’s animation (The Barnyard Concert, in which I can tell by the vertical pie eyes alone), his snout, style of angular movement, eye spacing and button proportions are uncannily similar to Mickey featured in the very first scenes of ‘Fiddling Around’, which I presumed was done by the unknown animator I mentioned with the limited body movements and the slow pacing and NOT by Jack King himself. During the time where Disney didn’t incorporate model sheets, Jack King goes in a bit different direction by the time of ‘Pioneer Days’; I can’t exactly put it to words, but any of the mice he draw look more fat and plump at times, in which their eyes also gets smaller. Jack King also joined in the middle of 1929 to direct ‘The Haunted House’, and until ‘The Barnyard Concert’, his animation style doesn’t seem evident in any of the cartoons in the Ub Iwerks era. By the time that this unknown animator started phasing out in which I can no longer see any of his style, Jack King’s own style starts phasing in. Speaking of ‘The Barnyard Concert’, it’s also yet another film in which I presume had a voice for Mickey that was someone other than Walt Disney, and probably the last until Clarence Nash steps in for ‘The Dognapper’. The falsetto vocals on the former short just don’t sound like they match up with Disney’s own; they sound like they were recorded by a girl. Now I’m starting to doubt Cannon did the scene I mentioned earlier. After watching more scenes, the way he spaces his eyes and draws them in several closeups is not alike any scene in ‘Minnie’s Yoo Hoo’. There’s a scene in ‘The Haunted House’ that looks like it could be his work, when Mickey finishes playing piano and slowly creeps. He doesn’t look to get any assignments on the earliest Mickeys…. the draft for ‘The Plowboy’ doesn’t have any mention for Cannon doing any scene. 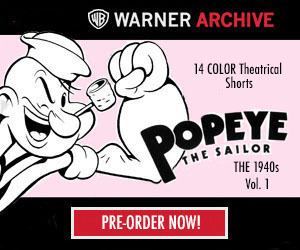 Just Burt Gillett, Les Clark, Wilfred Jackson, Ben Sharpsteen, and of course, in all holy matrimony, Ub Iwerks. Iwerks’ scene in Mickeys seems to get less recognizable heading towards the end of the Iwerks era, where his drawing style evolves more. By that time, things seem to start getting more loose. Or it could be Cannon after all. Comparing the clip of one of his possible scenes in ‘The Haunted House’, his torso, ear, and button portions are very alike to the same unknown scene in ‘Minnie’s Yoo Hoo’ with those eyes tightened together. Although, the scene in ‘The Haunted House” looks more flimsy when Mickey gets shocked, maybe it was the work of an inbetweener? Here’s what I can identify from ‘Fiddling Around’: Norman Ferguson animates Mickey unfoiling his hair and playing the fiddle until(?) the stage darkens, Merle Gilson(?, a complete guess) maybe could have animated Mickey bowing down announcing that he’s going to his final song, and then there’s a very smooth transition to what may have been Les Clark animating the rest of the scenes of this film. This scene is entirely just a bunch of long shots, I wonder what the draft would have looked like… one page long? Wondering if there was any attempt to leverage the 1950s Mickey Mouse Club to build theater attendance (beyond movie plugs on the show). You’d think it would be a natural, considering the original club’s evident success in that regard.